What makes connecting through LinkedIn so gosh darn hard is that it’s outside your everyday process. Wouldn’t it be great if instead of having to visit LinkedIn.com, you could connect directly with people within your email application? As you receive and read email, you get to see a link to the person’s profile and a Connect button? Guess what, there is! It’s called Rapportive, a browser extension that works with Gmail. Rapportive displays profile information on the right side of opened email messages, as shown here. Not only do you see the sender’s headline, location, and current position, but also Rapportive displays links to the sender’s LinkedIn profile and Twitter accounts. 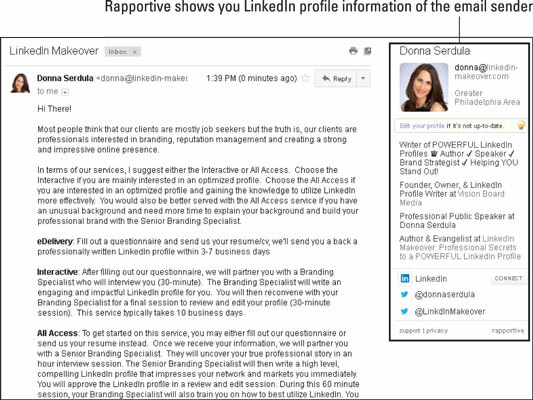 If you are not currently connected to the sender, Rapportive shows you a Connect button that you can click to send an invitation to connect on LinkedIn. Rapportive makes connecting with people a breeze!